Yesterday the UK Royal College of Obstetricians and Gynecologists (RCOG) issue sweeping plans for an overhaul of women’s health care. Within women’s health there is too much variation in outcomes from cancer to stillbirth, as well as a lack of choice… Today, we publish a report that sets out strong recommendations to ensure that our women’s services are world-class and well commissioned. Women’s healthcare should focus on preventing illness rather than firefighting after women become sick. In maternity, we need to co-ordinate services so that women receive the best care in the right place. Many women need only simple interventions, which can be done out of hospitals. This will mean more midwifery-led units and fewer consultant units so that the most specialist care can be concentrated and available around the clock. The real impetus is rather more grim. There is not enough money to staff and equip health facilities. Services are going to be taken away, but rather than admit to de facto rationing, the RCOG is trying to dress it up as a series of benefits instead of a series of losses. 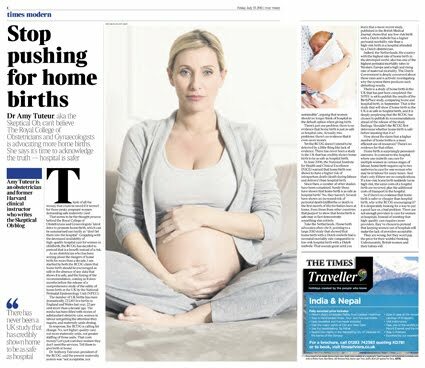 The Times of London asked me to write a piece in response to the RCOG’s recommendation to increase the rate of homebirth. You can find the article here, but it is unfortunately only accessible to subscribers. The number of UK births has risen dramatically, 723,165 live births in England and Wales last year, 22 per cent more than a decade ago. The media has been filled with stories of substandard obstetric care, women in labour not getting the attention they require, and maternity units closing. In response, the RCOG is calling for change. No, not higher-quality care; not more maternity units, not greater staffing of those units. That costs money! Let’s just convince women they don’t need the services. Tell them to give birth at home. There is a study of home birth in the UK that has just been completed: the NPEU is set to publish the results of the BirthPlace study, comparing home and hospital birth, in September. That is the study that will show if home birth in the UK is as safe as hospital birth, and it is deeply perplexing that the RCOG has chosen to publish its recommendations ahead of the release of the study findings. Shouldn’t the RCOG first determine whether home birth is safe before insisting that it is? In contrast to the hospital, where one midwife can care for multiple women in various stages of labour, home birth requires two midwives to care for one woman who may be in labour for many hours. And that’s only if there are no complications. If a low-risk home birth suddenly turns high-risk, the same costs of a hospital birth are incurred, plus the additional costs of transport to the hospital. So why is the RCOG encouraging homebirth? It is desperately looking for a way to put a good face on a bad problem. There are not enough providers to care for women in hospitals. Instead of insisting that high-quality care requires more providers, they’ve chosen to pretend that keeping women out of hospitals will make the lack of providers acceptable. They are wrong, but they won’t pay the price for their wishful thinking. Unfortunately, British women and their babies will.